The Kobo Aura One was released two years ago next month, and Kobo tends to release updated models just about every 2-3 years. Could they possibly have a 2nd gen model in the works? 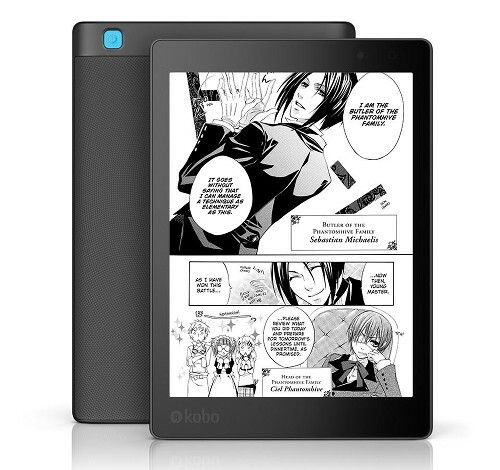 They’ve already released a replacement for the Kobo Aura 2 that was released at the same time as the Aura One. But I just don’t see a good reason to replace the Kobo Aura One any time soon. It’s still by far the nicest model that Kobo sells. My guess is they’ll wait until next year to release a new version. The Kobo Aura One was the first ebook reader to feature a 7.8-inch E Ink screen, and it was the first Kobo to come with a Comfortlight Pro to adjust the frontlight color. Personally I’d like to see a new model with page buttons and some folks would really like to see the return of a memory card slot, but those are two things that Kobo clearly seems to be against adding to their ebook readers so it’s unlikely they’d suddenly change their opinion on the matter now. The Kobo Aura One is arguably the best Kobo ereader ever released, and it remains a popular model. But it could still be improved in some ways. The touchscreen, for one, has never been as accurate and responsive as other touchscreens. Battery life could be better as well. They could also upgrade to a faster quad-core processor, but that might just make battery life worse. Do you think Kobo should release a 2nd gen Aura One? If so, what kind of upgrades should it have? Two additional wishes, but also very unlikely to be implemented, are better pdf reading capabilities with autocrop mode (a la kooreader) and the possibility to make annotation in pdf files. The Aura One is by far the best ereader ever made. It’ll be a long time before Amazon makes a device of such beauty. But just imagine, wow. The Aura One is so perfect it doesn’t need to be replaced anytime soon honestly. It’ll still be at the top of its game 5 years from now. Thats how good it is. Seriously how can you improve on perfection? Page turn buttons? Nah.. I don’t own this device because it doesn’t have page turn buttons. In the end that was more important than the extra .8″ and I ended up with a Kindle Oasis. Kobo needs to improve its software. Its Overdrive integration is laughable, its PDF processing is slow, and typography can always be better. The single most important feature is inverted colors, same as Kindle. You can do it, Kobo! Just curious, but why do you want this? I only use it because even the low setting is extremely bright at night, but the Aura can make the screen orange, which does not hurt your eyes. Agreed on better PDF rendering with autocropping & annotations. Overdrive integration. Virtual printer emulation so PDFs can be sourced from other devices. Linux OS. In hardware, faster CPU, audio with TTS, programmable page turn buttons (2 on each side), Bluetooth 4.2 for keyboard option (could double for audio speakers), microSD expandable storage (#1 essential! ), solar charger case option. Integrated microphone with speech to text notations would be nice. Last but not least, the ability to conjoin two units at the spine into a two-page folding reader! I’d like to see a more accurate touchscreen and a better dictionary. Better PDF handing could be useful too. Otherwise the device is pretty much perfect. I’d dump the crease for the stand option on the official cover, then that would be perfect too. Page buttons ONLY if flush screen like the Kindle Voyage ones, with an option to turn ’em off. Otherwise, I prefer they NOT ruin my flush screen experience with buttons. FWIW, I have the Kindle Oasis 2 in addition to my Aura ONE and the wider form factor to accommodate those blamed buttons makes it a pain to hold. It is relegated to proofreading at present. Maybe not so much as a replacement for the Kobo Aura One, but a higher end model. The new 10.3″ readers are popping out everywhere, but prices are insane, and quality is questionable. I would love to see something like Kobo Aura Note where it offers same screen size (and possibly a pen) for something close to CAD 450. This is a new competitor in 7″8: Inkpad 3. 1. More responsive UI and hardware (screen touch), the delay of more than 1 second is quite noticeable. 2. Wifi on 5Ghz. Recent Raspberry Pie computer can do it, I’m sure they can affort it. 1.Audiobooks with Bluetooth. so headphones connect. 2.Solar charging while reading through screen. 3. Cover flap built in so no bulk. (Sony did it on last reader.